by Amy Payne, Heritage Foundation: The Congressional Budget Office just dropped a budget update on Washington, and it’s not good. The U.S. government is spending recklessly—and Obamacare is adding fuel to the fire. The new report comes at a crucial time, as negotiations over the debt limit are starting up again. Here are some basics to help you cut through all the political spin. Yes, it’s the legal limit on federal government borrowing—but the debt limit is a wake-up call. It’s a chance for Congress and the President to stop the spending insanity. Government spending is accelerating with no end in sight as long as entitlement programs keep expanding. Entitlement spending is the biggest driver of skyrocketing debt. In only 10 years, Social Security, Medicare, and Medicaid will devour half of the federal budget. In a new Rasmussen poll, 58 percent of Americans “favor a federal budget that cuts spending.” Right on. Congress should cut spending, reform these programs that are ballooning the debt, and put the budget on a path to balance within 10 years. 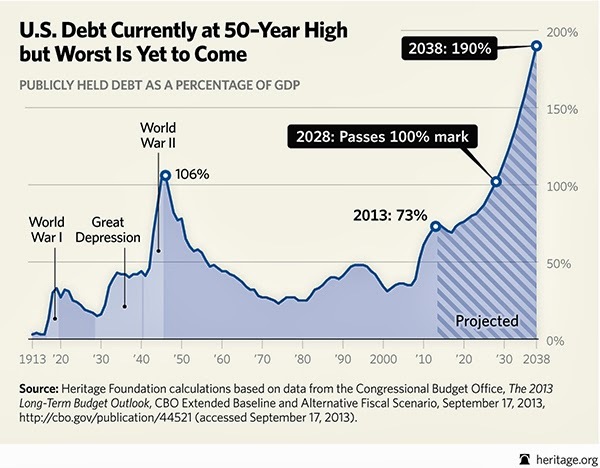 Facing the debt ceiling gives them the opportunity to correct the catastrophic course we are on. Tags: CBO, congressional budget office, debt, Debt Ceiling, debt limit, entitlement spending, federal budget, government spending, health care spending, medicaid, Medicaid expansion, medicare, national debt, social security, Amy Payne, Heritage Foundation To share or post to your site, click on "Post Link". Please mention / link to the ARRA News Service. Thanks!